Farfalle and ChanterellesFall means fresh mushrooms of so many varieties. You can forage for them yourself, buy them from your Farmer's Market or the grocery store. 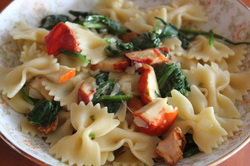 I was able to get some fresh lobster mushrooms as well, so I added them to this recipe. If you are unable to find them just use the Chanterelles, but make sure you use fresh and not dried mushrooms.